It's been an interesting couple of days for Johan Santana's rehab from shoulder surgery — or perhaps more accurately, for the coverage of Santana's rehab. 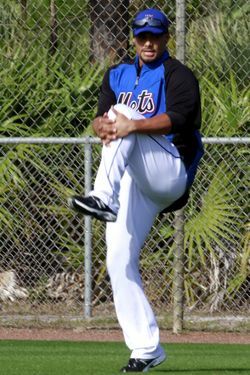 On Saturday, under the headline "Johan Santana's season in jeopardy for the Mets," Steve Popper and Bob Klapisch of the Record wrote that "one member of the Mets' organization said that the team is ready to shut down the rehabilitation schedule for Santana if he does not feel comfortable after what is expected to be a simple session of playing catch." Then yesterday, Santana, as well as pitching coach Dan Warthen and GM Sandy Alderson, responded to the report by saying that the lefty was right on track. Said Santana: "I don't know who's saying that I'm not ready or whatever because according to everything, the way it has been done, we're right on the right track and where we're supposed to be. Whoever is saying that I'm not ready I think is lying." So who's telling the truth? No one really knows for sure (except, presumably, for Santana, his doctors, and Mets brass). But skepticism abounds. Eric Simon of Amazin' Avenue, for example, argues that reporting that the team is ready to shut down Santana if he suffers a setback "[says] something without really saying something." Which is true, though the Record's contention that "according to the source, Santana has not been progressing in his return to light throwing and the team is concerned enough to halt this section of his rehabilitation" has a bit more substance to it, depending, at least, on how much stock you put in unnamed sources. Meanwhile, over at HardballTalk, Craig Calcaterra questions whether the Mets' statements about Santana's progress should be taken at face value, pointing to last year's refutation of a report that Kelvim Escobar was seriously hurt. The difference this time: The Mets are under new management now. Writes Calcaterra: "I'm hoping that the Sandy Alderson regime has put an end to the propaganda and I'm hoping that Popper and Klapisch merely spoke to someone with bad information because life is better when Johan Santana is pitching than when he is not." Also skeptical of the Mets' assurances that Santana is on pace to return in the second half of the season: Kevin Kernan of the Post, who writes that the Mets are in denial about Santana returning this season. He says that Santana, who had surgery last September, told him yesterday that "it could take up to a year. I'm aware of that." (Could, of course, seems to be the operative word there.) For what it's worth, if Santana really is on track and doesn't suffer any significant setbacks, Alderson said last month that he is scheduled to return by mid-July.